The event has now been fully announced and confirmed by the organisers. The 'Mother Of All Rock Festival' takes place on Saturday 7th October at the Forum Arena Monterrey on an outdoor stage. Zignia Live and the festival website announced on 26th May that the line-up would be revealed today and it was broadcast live on Facebook from 5pm local time (watch the video below). Def Leppard's last show in Monterrey was in September 2014 at the Monterrey City Festival at Parque Fundidora. 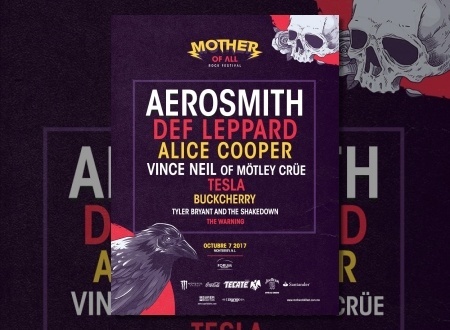 Aerosmith headline the event with Def Leppard, Tesla, Vince Neil, Buckcherry, Alice Cooper also playing. Tyler Bryant & The Shakedown from Nashville play before the main acts with Mexican female trio The Warning on first. This is the band seen at the start of the announcement video playing covers of songs by all of the other acts on the bill. Their lineup features three teenage sisters. The fourth confirmed date of the four shows Joe said they would be playing together. Guns N' Roses were rumoured to have combined their own planned date with this show but then decided to pull out. This (apparently) delayed the announcement. They start a new run of US arena shows on 8th October. Tickets go on sale from 4th June. Online profiles for one of the band's playing (who may originate from Sheffield) somewhat ruined the festival announcement (oops...). One other rumoured show in South America has also now been confirmed to "not" feature Def Leppard. A 15th September show in Quito, Ecuador will only have Aerosmith, Incubus and Walk The Moon on its line-up. DL had been rumoured for this show by local fans. 46 shows have now been announced for the 2017 tour. The first show in this city since September 2014 at the Monterrey City Festival.